We offer both a la carte services, as well as fully outsourced marketing solutions. Below is a list of some of our most popular services, but doesn't fully encompass our offerings. Need help with something that's not listed here? Send us a message! Not sure what marketing services you need? Don't worry, most of our clients come to us needing a little guidance on how to proceed. We can setup a phone call to better understand where your company is at and what types of services will best help you achieve your goals. Not sure what you need? We can setup a phone call to better understand where your company is at and what types of services will best help you achieve your goals. Adwords is our core service for repair shops, because it’s the most effective and efficient way to bring customers to your shop. Most people don’t know where to go when they break their phone screen so they Google it, and Adwords is the fastest way to ensure that they see you. Managing your cost-per-click, optimizing your ads, targeting the right areas, and enabling the right extensions can get complicated and time-consuming, but we’ve streamlined the service and can make sure your ads are delivered to the right people at the right time, at a reasonable cost. Running Adwords yourself? I'm sure you're doing a great job. However, if you're running a business and trying to manage your own Adwords account, there's a good chance you're not getting into your account at least once a week to keep up with the kind of maintenance that's needed to keep costs low and performance high. Let us take some work off your plate. Already have an agency? I bet we're less expensive (if not, we'll match it). I bet we're also more experienced in this particular niche and we're more transparent about how we're managing your account. It's not that we're superhuman marketers - we're good, not gods - it's that we know this niche. We've spent over a million dollars (and almost a decade) on Adwords in this niche. This wasn't client money either, this was "I could've had a few lambo's in my garage" right out of my own pocket money. So we know this niche and we learned to be efficient and effective with our ad spend. Facebook and Instagram ads are HOT right now. And for good reason. The ability to define your audience by location, demographics, interests, and behaviors allows advertisers to laser target ad reach. Want to run ads to only people within 3 miles of your store that use Facebook on an iPhone 7? How about affluent parents with kids in high school? Yep, that can be done. Beyond the targeting options, you're almost always getting a high quality impression. With traditional media like TV, Radio, or Billboards, every 'impression' can easily be missed. 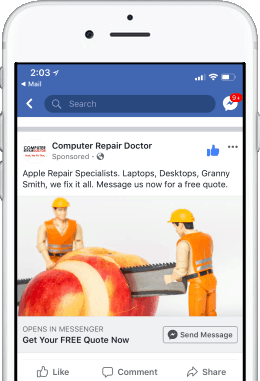 With Facebook news feed ads, you're nearly guaranteed that every impression will actually give your ad a chance to make an impact. We can put together slideshow video ads for you, or utilize your own creative to deliver a strong message to potential customers nearby your store. Ready for an insider secret? One of the biggest reasons paid ads fail is due to low quality landing pages. Want to boost sales? Boost your conversion rate. You're paying a lot of money to get people to your website and you need a solid set of landing pages that can pull their weight. Does your landing page give the user the information they're looking for in the first few seconds? Does it have a clear Call to Action? Is your local store information featured on the page? Is there a logical flow to the page design or does it seem like an incoherent jumble of page elements? Does it inspire trust by featuring testimonials or branding reinforcements? If your page checks all these boxes - great! If you think a professional could add some TLC to your site, give us a call! Ever been stalked by an ad? That's retargeting. A retargeting campaign will compile a list of users who visit your website, and then show them ads for your services all over the web. Retargeting ads can run on Facebook and Instagram, mobile apps, inside YouTube videos, or on millions of supported website. Retargeting ads are a great way to get in front of customers who have visited your website, but haven't converted. 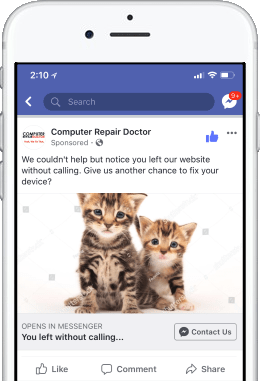 Giving these users a reminder that they were looking into fixing their phone is a great way to increase your website's overall conversion rate. We can create ads for you, or you can provide your own digital ads and we’ll push them out to Facebook and Instagram, or the entire web by utilizing the Google Display Network. SEO stands for Search Engine Optimization - aka. the art of ranking high in the infamous Google Search results. Good SEO means your website will show higher on the page when people search for terms you care about - like 'phone repair' or 'computer repair'. 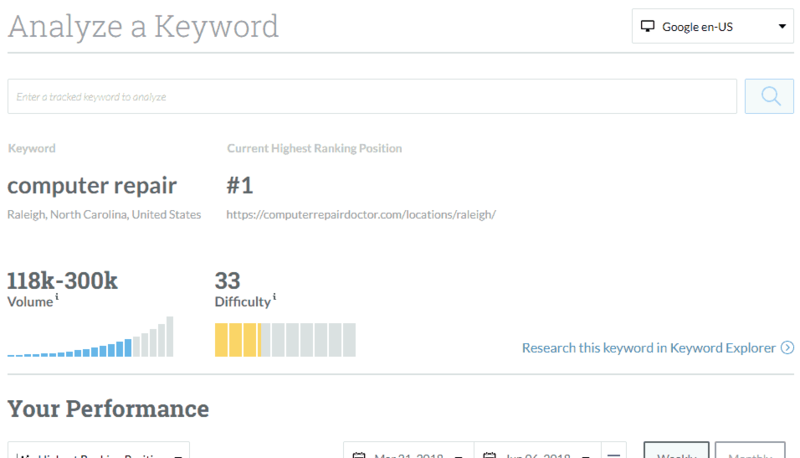 And the higher you rank, the more clicks you get. SEO can be a lot of work and takes months to see results. But there's no better investment in long term lead generation. We'll help with onpage SEO, citation management, and work with you on link building strategies and content marketing. All of these are small ways that help Google figure out what your website is about, and when done properly - will help you achieve higher rankings on Google. You've probably got a website, but how happy are you with it? And more importantly, how enthused are potential customers with your site? If you're ready to admit that your site could use some work (or a complete overhaul), then we can help. We can help you by creating a website from scratch, or we can use one of our templates that fit your specific needs. We’ll make sure your website follows general “best practices” for SEO to help increase visibility, while also making it clean, coherent, and high-converting. Here's two examples of sites we've built, but the possibilities for your new site are endless. 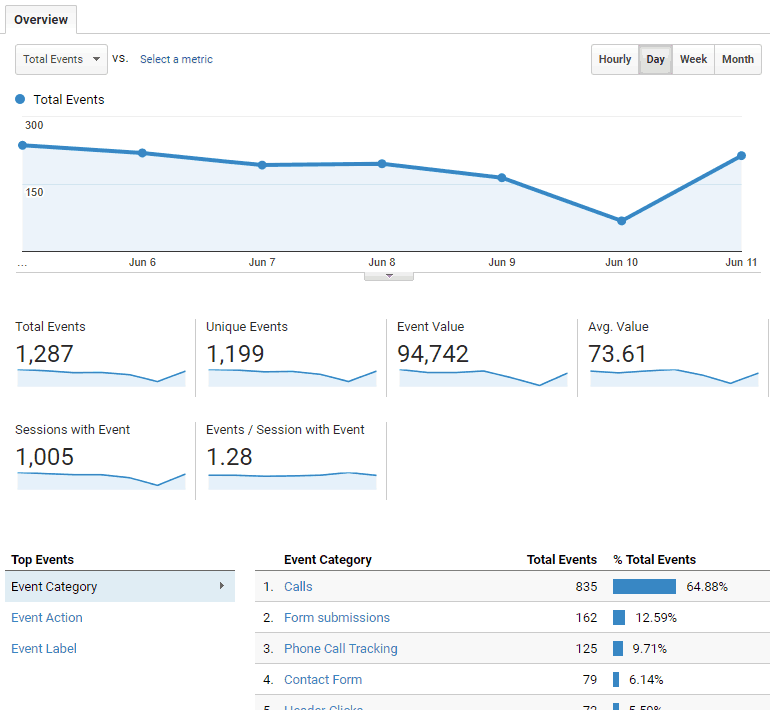 Setting up Google Analytics is only the first step. Tracking web interactions, online and offline events, lead submissions, and conversions is the next step. We can also setup visitor screen recording so you can watch how your visitors interact with your website, and heatmap click graphs to better understand which onpage elements are getting the most attention. And most importantly, all of this data will create a closed loop system with your Ad campaigns to allow Google to automatically optimize for conversions. Let machine learning work for you. Do you maintain an email list of your clients? For most of us, the answer is yes. But how often do you get around to utilizing that email list? And more importantly, how effective are the email campaigns you've been running? If you're looking to take your email game to the next level, we can help. We'll work with you to create email campaigns based on specific deals, trending tech news, or company specific announcements. And if content for an email blast is a concern, we can work with you to create blog posts for your site that can double as content for an email campaign. Work smarter, not harder.